Addis Ababa (sometimes spelt Addis Abeba) is a diverse and riotous capital city of well over three million people, home to roughly 80 different nationalities, and a multitude of distinct religious and linguistic groups. Nestled at the foot of Mount Entoto, Addis Ababa was founded in the late 1800s by Ethiopian Emperor Menelik II and was later occupied by the Italians during the second Italo-Abyssinian War. Once the Italians had been ejected, Emperor Haile Selassie immediately set about rebuilding the capital and formed the Organisation of African Unity, replaced by today's African Union, which still has its headquarters in this proud African city. Addis Ababa is also home to the world-renowned early hominid, Lucy, whose skeleton is housed in the Ethiopian National Museum. The city also boasts several interesting mosques and cathedrals, Menelik's old Imperial Palace, which is the official seat of the Ethiopian government, and one of the largest open air markets in Africa (in the Merkato district). Addis is the perfect place for tourists to buy souvenirs of their stay in Ethiopia. Top of the shopping list is likely to be a pack of Ethiopian coffee beans, preferably vacuum sealed to preserve freshness. Decorative metalwork, in the form of crosses, and painted religious artworks on carved wooden boards are also popular. Filigreed silver and gold jewellery is also a great buy. Addis Ababa is also the best place in Ethiopia to sample the local cuisine which is inventive and flavourful. Addis Ababa is an interesting mix of poverty and wealth, urbanisation and nature (the city is surrounded by forests and cultivated land). It is a dynamic capital and not without charm, but has its fair share of unemployment, petty crime and destitution. Ethiopia's capital is a loud, chaotic, and industrious city which is alive with people in search of a better life. Most travellers merely pass through Addis, as it is the main transport hub of the country, but this transit shouldn't be rushed. 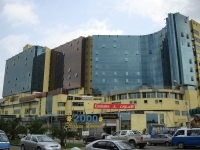 Addis Ababa is a good two-day tourist city, offering travellers an authentic taste of urban Africa and enough interesting attractions to make a decent sightseeing itinerary, but more than a day or two is probably unneccesary, particularly considering the wealth of world-class attractions awaiting visitors beyond the confines of the city.